I first visited Paris as an art student back in 1977 and fell in love with the city. Since then I have returned every year. From the moment I take my first breath of that curiously Parisian air – a mixture of coffee, Gauloises and Chanel No 5 – it feels like being back home. Before too long I’ve settled into the rhythm of the city: coffee and croissants in a pavement café as the world bustles about its early morning business, extended lunches with a good bottle followed by an even more extended walk to burn it off, and lingering over an evening meal and convivial conversation before a last, moonlight stroll through the ancient cobbled streets of the Latin Quarter. Another major attraction is wine-shopping of course. Unfortunately, Paris can be a great disappointment for the food andwine lover, with as many touristy, mediocre restaurants and snobbish wine-merchants as any other city. Hiked-up prices for the great wines are commonplace, however some recent developments have really lit a flame under the fine wine scene (see below). 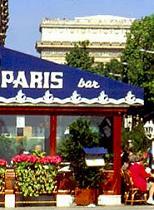 Paris has an enormous number of hotels as befits its role as tourism capital of Europe. At the budget end of the market think two-star minimum (the one stars are normally just a short step from backpacker doss-houses), and if you want modern amenities and comfort three stars is more relaistic. For this you will have to pay around 100€ per night for a double room. At the budget end I highly recommend Hotel La Famila at 11 rue des Ecoles close to the Latin Quarter and Notre Dame, where I have stayed many times. Clean, bright and extremely friendly, it is both well-positioned and a cut above many similarly priced two-stars. If you have more cash to spare (around 160€ and up), the Melia Alexander Hotel at 102 Avenue Victor Hugo is a delightfully bijou “boutique hotel” with smallish rooms, but big marble bathrooms, fluffy robes and lots of luxury. It is within strolling distance of the Champs-Elysées. Telephone 01 01 42 22 00 11. Métro Sèvres-Babylone. I enjoyed a stunning meal at the two Michelin starred Hélène Darroze. Darroze is from the Southwest of France, and her menu reflects the ingredients and dishes of the region, in a very sophisticated interpretation. I had the tasting menu of eight courses, at least four of which were breathtaking (the sort of delicious food that has you asking “how did they do this?”) and the other four were merely excellent. Highlights included a carpaccio of lobster served with a salad of crunchy summer vegetables, black truffle and lobster jus, and a stunning dessert: raviolis of apricot stuffed with an almond cream in a fresh thyme and almond soup, and served with an apricot and thyme sorbet. Somehow, thin slices of the apricot flesh had been moulded into perfect raviolis containing the almond cream. You can opt for a glass of wine of the restaurant’s choice served with each course, but I chose from the very good list, which is strong on southern France and has plenty of half bottles. Hélène Darroze is super-expensive (this menu is £100 per peson without wine) but this is brilliant food, with friendly but immaculate service, served in an atmosphere of casual elegance. There is also a downstairs bistro serving tapas-like dishes. I’ve heard it is very good too, but make sure you specify where you want to dine when booking (2003). Closed Sunday, Monday. Pavillon Montsouris, 20 Rue Gazin, 14th Arrodissement. Telephone 01 45 88 38 52. Métro Porte d’Orléans. For a really different option, great food and a lovely atmosphere, the Pavillon Montsouris has just been refurbished and relaunched in the south of the city (near Montparnasse). It is a fine gourmet restaurant with moderate prices, which has a broad terrace in one of the nicest corners of the parc Montsouris, overlooking a woodland and a lake. The park closes at dusk, and from then on you have this beautifully quiet countryside and lake to yourself, yet slap bang in the middle of the city. The set-price menu is 45Euros (about £30) for four courses including coffee and petit-fours. The wine list is presented as a large scrap-book full of labels, and the prices and selection are decent, if uninspiring. But the atmosphere of this place is what makes it really special on a warm evening when you can sit outside, and the food is very good and prices low. The RER station Cité-Universitaire is actually closer than the métro (2003). Open every day, except Sunday evenings from September through Easter Sunday. Telephone 01 42 61 05 09. Métro Palais Royal. Owned by Englishman Mark Williamson, Willi’s is a bit of an institution amongst Americans and Brits living in Paris, as well as visitors and discering locals. The tiny frontage is easily missed, with a long bar beyond it crowded with happy drinkers. Pass the throng, and Willies opens out a little to a small dining room seating perhaps 40 at most, and decorated simply with the atmosphere provided by noisy chatter and friendly service. There’s a main wine list with a hundred or more bottles from all over France, and from other countries, with moderate mark-ups. A bottle of Tollot-Beaut Savigny 1er Cru comes in around 35 Euros (£22), and the delicious Chambolle-Musigny from Anne Gros which we enjoyed was 70 Euros. On the other side of the menu is a fine selection of wines by the glass. I chose a moelleux Jurançon “Novembre” from Cauhapé, at a modest £4 for the glass, which washed down some little roasted vegetable crisps perfectly. The menu has around 10 choices of entrées and plats, plus half a dozen desserts. My seared Tuna was cut as a thick steak, peppery and black on the outside, moist and pink on the inside. The accompanying little warm salad was piquant and a perfect foil. I chose a “signature dish” pudding; a densely-textured, bitter ganacha chocolate terrine. Willie’s food prices are very reasonable, at around £16 ($25) for 3 courses. A casual, welcoming and delightful little bar and restaurant (2002). Telephone 01 46 33 68 69. Métro Maubert-Mutualité. I returned to this restaurant, reviewed last in 1999, as I was in the area and because there is a more limited choice of places to eat on a weekend night in Paris – especially if you have neglected to reserve a table. I was actually delighted with Le Coupe-Chou, where as well as its dramatic and ancient atmosphere, the simple food was delicious on this ocassion: a lovely scallop and vegetable stew served inside puff-pastry, followed by medallions of monkfish with a provençal sauce, and finishing with a tarte-tatin of heroic proportions, brought to the table with a large side-dish of creme-fraiche and a spoon, which was too tempting. The wine list is still pretty anonymous, but a bottle of Pouilly-Fumé 2000 from Max Roger was steely yet full of fruit, and excellent. Le Coupe-Chou is not cheap and is on the tourist trail, but I really enjoyed my evening there (2002). Open every day. About 110 Euros (£75). Telephone 01 44 07 04 24. Métro St-Michel. This tiny, bijou, two-person operation is tucked into a little street just off the Quai St-Michel, opposite Notre-Dame. The chef/proprietor bustles back and forth from kitchen to front-of-house at busy times, making and serving inventive and elegant modern bistro food. This is classy cooking, like seared fillets of sea-bass served on a bed of samphire and haricots with a smoky garlic sauce. Puddings too are stylish and tasty. Reminet’s wine list is fairly short but nicely put together. It’s also fairly inexpensive: a very nice Alsace Riesling from a small grower was less than £10($16) per bottle. Very modest food prices, at around £15($24) for 3 courses (2000). Telephone 01 43 80 40 61. Métro Charles de Gaulle Etoile. There’s a fashion for Paris’s top Michelin starred chefs to open inexpensive bistros near their posh restaurants. This is owned by, and sits opposite restaurant Guy Savoy, not far from the Arc de Triomphe. The place is tiny and busy, but offers really fine modern bistro food at around £15($24) a head lunchtimes, a bit more at dinner. My baked fillet of mullet on a spinach and celeriac mash, doused with a frothy velouté sauce was delicious. Wine list is very short, but has some nice stuff – the Laroche Petit-Chablis was just fine (2000). Telephone 01 42 97 20 20. Métro Madeleine. Part of a huge new wine shop (see below), Lavinia features a casual, very modern and chic lunchtime restaurant and wine bar. You can drink anything purchased in the shop without corkage charge, or order from a nice by the glass and bottle selection. Food is tapas-like mix and match. I had great tempura prawns and a delicious Jurançon Sec by the glass (2003). Closed Sunday, around £15 per person. Telephone 01 42 97 20 20. Métro Madeleine. Next to the Madeleine (just round from Fauchon, below), is Paris’s biggest and stunning new wine shop, Lavinia. Some might know Lavinia in Barcelona, and this is the same group: three enormous floors with the biggest selection of wine I’ve ever seen under one roof. Amazing strength from all over the world, with for example the best collection of top Portugeuse wines I’ve seen on sale. The basement level is French, and is huge, with a vast fine wine cave for really special bottles and collections in large formats. Staff are very friendly, and on the top floor as well as glassware, books and accessories, is a very good wine bar and restaurant (see above). I bought some old Burgundies, which had come from a Beaune restaurant’s cellar, at fair prices. Telephone 01 45 61 14 09. Métro Charles de Gaulle Etoile. Perhaps Paris’s finest wine merchant, Taillevent has an astonishing strength in depth, from ancient vintages of enormously expensive classic wines, to exciting wines from little-known French regions at a few pounds. The shop itself displays only a small selection of its wares, but a full list is available for consultation. The staff are young, friendly and knowledgeable, and there are always a selection of bottles open for tasting. Most Saturdays there is a tasting in the company of a wine-maker. Highly recommended. Telephone 01 44 22 16 97. Métro St-Augustin. Credited as the oldest wine shop in Paris, Augé’s premises is a blast from the past and a visit makes for a fascinating experience in its own right. Though well stocked with fine clarets and old Armagnacs, there is a well-chosen and unstuffy selection of fine wines from interesting regions at reasonable prices. I didn’t meet Sommelier Marc Sibard, but he has an excellent reputation for offering sound advice. Telephone 01 46 33 90 35. Métro Luxembourg. Directly opposite the wonderful restaurant Perraudin. This is one of my favourite, and relatively “undiscovered” stores. Small and well stocked, there aren’t many classy clarets on offer, but the range of Champagnes, Burgundies and Rhônes is strong and well priced, and there is a very personal and fine selection of Loire and Southern French wines. Excellent service and advice is on offer from dedicated staff. Telephone 01 44 39 81 00. Métro Sèvres-Babylone. Part of one of Paris’s greatest food stores, this venerable wine merchant is another gem: thanks to its astonishing selection and surprisingly competitive prices. Again, Champagnes are strongly represented, as are the classic French regions and other quality world wine areas. A great place for picking up both expensive older vintages and quality inexpensive wines. Combine it with some food shopping for a memorable visit. Telephone 01 47 42 60 11. Métro Madeleine. In the past year or so the cramped, old, congested cave of Paris’s number one gourmet store has gone, to be replaced by a very posh new wine section in the space formally occupied by the basement tea-room. The new quarters are airy, elegant and rather soulless. The old shop was a browser’s delight, the new one is a touch intimidating. I also found prices steeper than I recall. However, every famous French Château and Domaine is here, with vintages of Latour, Yquem or Romanée-Conti stretching back into the mists of time. At a price. Métro Maubert-Mutualitié (and straight up the hill). This isn’t a fine wine store by any stretch of the imagination, but it always has some of the cheapest Champagne prices around. Well worth a look if you’re in the area. Telephone 01 42 68 00 16. Métro Madeleine. There are branches of this chain literally all over Paris, but here at their flagship store there is their full shop range and also a special fine wine selection in the basement, with all the top wines of France held in several vintages. Prices are moderate. The top floor has a café/wine-bar, with some interesting wines by the glass – though I didn’t try it on this visit.